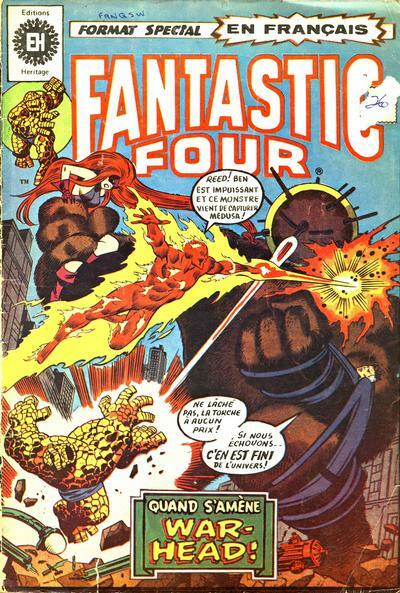 Most of the covers of the reprint series are lifted from the original comics, with just the English translated into French. 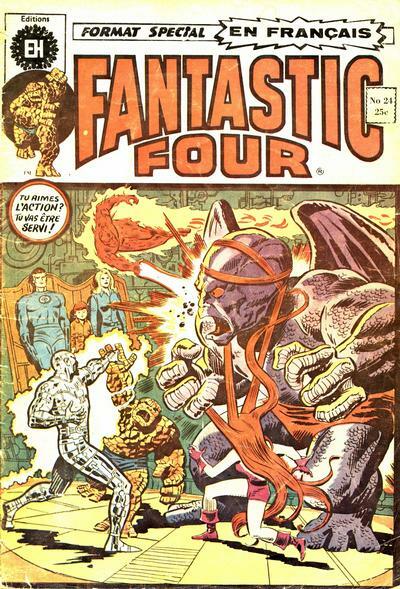 But for some reason, the issue reprinting Fantastic Four #136 doesn't have use the original cover art, but a panel of interior art. It's been modified a bit to accomodate a slightly wider format, but there was clearly some form of reproducible art still around. The best I can guess is that the cover art for the Canadian reprint might have been sent up north separately. 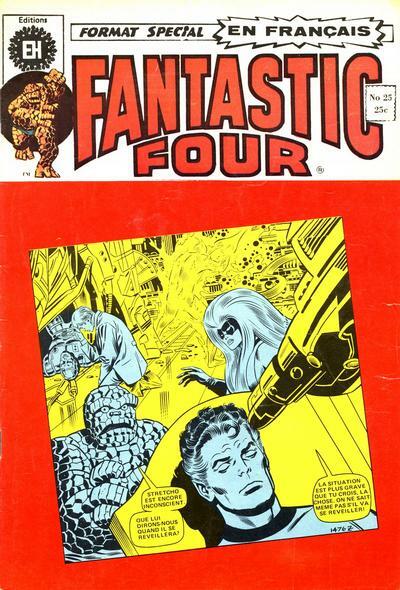 The issues were in black and white, so they would've only needed the black line art (probably stats) for the interiors, but the covers used color and it seems probable that Marvel sent the color separations for the covers up to Canada. Those could have been handled differently, or from a different department, so I can see a situation where the Canadian printers simply didn't receive the cover art in time to hit their production deadlines. 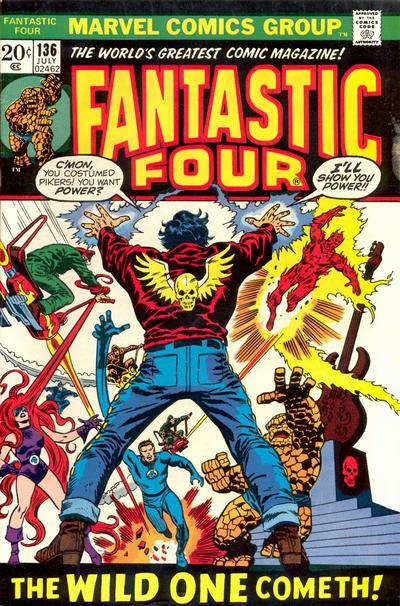 In such a case, utilizing interior art like a splash page makes sense. But, then, why the strange treatment? Why the odd angle? Why the red border? 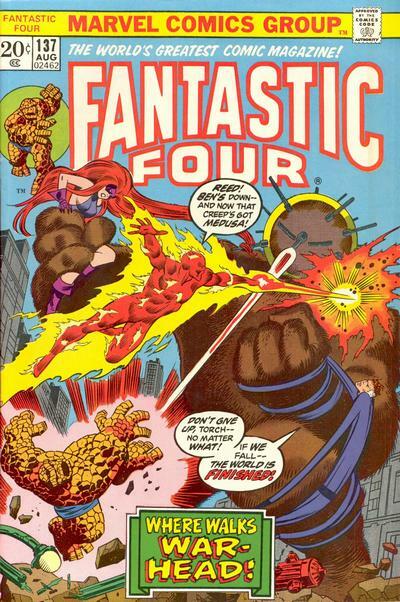 Why color some of the figures, but not the Human Torch? And why color the figures with the least intense color of the three chosen? Questions I do not have even speculative answers for. 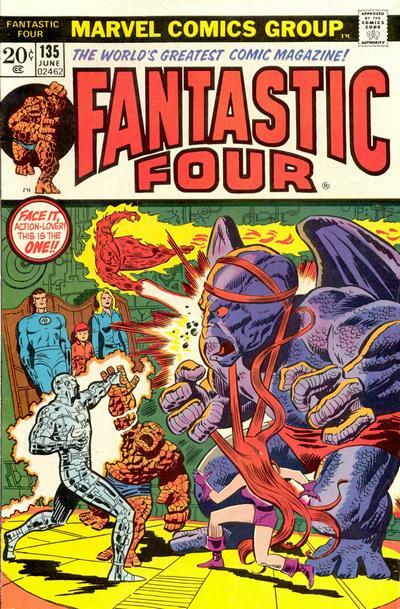 UPDATE: On further study, I think that The Complete Fantastic Four cover is in fact an entirely new piece of art, recreated based on the original. The more I look at the two, the more discrepancies I see: Medusa's left boot, the Torch's flame aura, the placement of Thing's left hand, the number of steps on that statue, the placement of the upper bike rider... There are more issues there than would be touched up for the size difference. 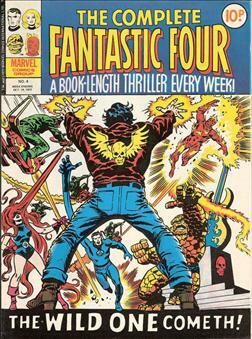 Which leads me to think that the actual cover art for FF #136 was lost in the mail, and John Buscema recreated it based on a printed version. Whether he did so specifically for the British reprint, I can't say, however.